Happy All Hallows Day and Eve all! Tomorrow see the beginning of November, the ninth month of the Roman calendar, and -in the traditional Irish calendar- the start of Winter as well as being All Saints’ Day. Tomorrow sees the beginning of NaNoWriMo (National Novel Writing Month) which I will be participating in, as usual, and perhaps I will even complete it this time this time the Sea of Stars will be my canvas. In light of that, and seeing no obvious theme to November I will just write about whatever inspires me as I have time from NaNoWriMo, but the Tuesday Magic Items will continue! Madam Morisque spoke, her voice quiet across the darkened room, “You must be still and silent until the spirit comes into me, then we will communicate with your lost love ones. At least, those that can cross the veil to find us.” She slowly pulled on the featureless silver mask. For a few moments nothing happened, then the mask started to deform and twist, reshaping itself into a harsh, male face. “Is my worthless son here? I hope so, I have word for him,” spoke a harsh, hollow voice from behind the mask. These masks are made from a variety of materials: wood, metal, ceramic, but they are always featureless on the outside. The interior is often inscribed sometime with summoning and protective magics, other times with prayers or names of the dead. When a spirit is called, the mask will take on the visage of that spirit and the medium will speak in a semblance of the spirit’s mortal voice. Class Acts: Alchemists, 18 New Discoveries provides 15 new discoveries and 3 grand discoveries. There are some interesting choices for the alchemist, with some informational discoveries such as autopsy (which could have been expanded, it is useful but it could have been really useful with some additional detail) and deep analysis, modifications to mutagens and potions, overall a good set of options. In the grand discoveries, radiation bomb worries me as being both powerful and a little out of genre, a GM should consider very carefully before allowing it in their campaign. Overall, this product provides a good selection of new options for the alchemist. “They have broken through the inner defenses, my master,” reported the Commander of the Bone Guard, his wounds dripping, bowing down before the Master of Drawn Blood. The heroes charged into the last chamber, only to see the Commander perish in a spray of blood, his throat slashed and the Master vanishing through the spray to somewhere else. These twisted weapons have blades made of iron that always seems stained, the grips are always made of bone, usually angel or demon, though often wrapped and concealed. In areas of high magic or around recent death inscriptions are revealed along the blade. Coming through the dark and leafless woods is the moving skeleton of a massive stag, the span of its antlers wider by far than a tall man’s outstretched arms. Its body was bare of flesh, the bones bleached white and dotted with flowers equally as white, for a moment, when the moonlight shown down, it almost seemed a being of purity, rather than the unnatural terror it was. Weaknesses vulnerability to sonic Read the rest of this entry ? Throughout the night, the wagons rolled on muffled wheels bringing its cargo of weaponry to the oppressed people. For too long, they had suffered under the harsh policies and ill-treatment of their so-called “betters”. In the morning, their sympathizers would seize the gates to the city while servants in the keep opens the doors to the rebels. By the end of the day, the people would be in charge and the streets would run red with the blood of the oppressors. If everything went according to plan . . . These weapons are just as often long spears as pikes with heavy iron spear heads set on a reinforced pole of dark wood, where often darker stains on the wood can be notice by those looking for them. 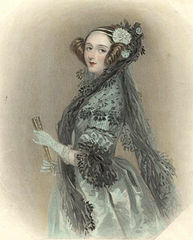 Ada Lovelace Day is an international day of blogging to raise awareness of the achievements and successes of women in technology and science. This year it is today (16th October). And, lastly, one would be remiss to not mention 2D Goggles where, in the universe next door, Ada Lovelace is a adventerous science heroine. Notes: Picture from the Wikimedia Commons and is in the public domain. You are currently browsing the Sea of Stars RPG Design Journal blog archives for October, 2012.